I am helping out a couple of earthlings today, Lorrie and Jay. As you can see, they have just entered into wedded bliss after only 24 years of living in, well, unwedded bliss, shall we say. It helped that the Federal Govt changed its stupid Marriage laws so that everyone can now enjoy their first crockery-throwing barney together as hitched individuals. So there. And a big shout out – SHOUT OUT – to dear Jodi for her most excellent haiku, also known as a Verandaku – and love to Wayne, too. 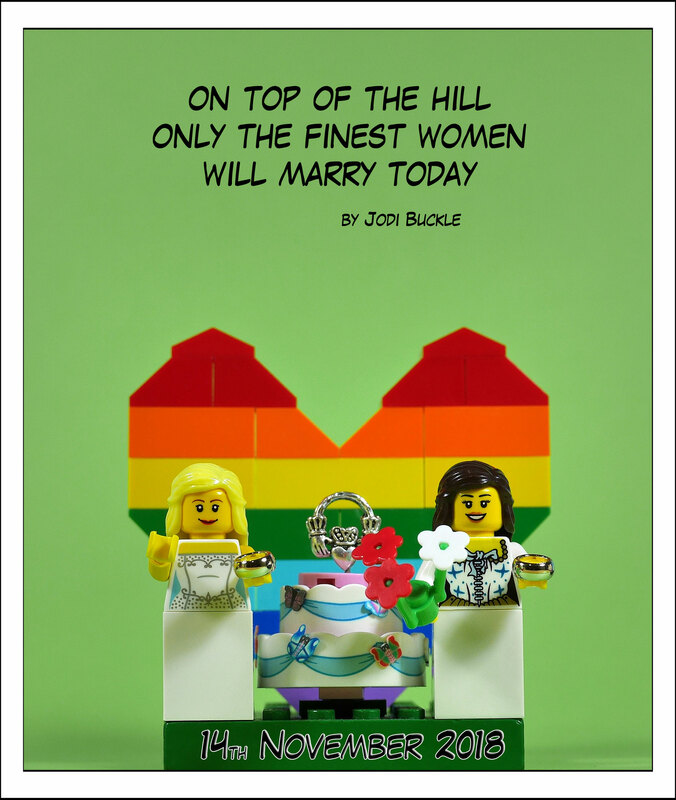 This entry was posted in Special Occasions and tagged brides, cake, claddagh ring, lego, minifigures, wedding on November 15, 2018 by Jay Verney. Congratulations to both earthling ladies. I wish them lots of love and every happiness high on the Hill. May thier crockery shots only cause minor injuries.